India has only 4 poisonous species of snakes. But many people die of snake bites In India than the number who should. 9 out of 10 people die as they believe that they are bitten by poisonous snakes? In other words IT IS ALL IN THE MIND - WE ARE WHAT WE BELIEVE. This is what happens. A man is bitten by a snake. He believes that he is bitten by a poisonous snake. As he believes that it is a poisonous snake, the mind tells the body that it is a poisonous bite and the body accepts it. The shock kills the man. The rustic snake charmer has a role in this process. The man bitten by the snake is rushed to the snake charmer. Remember in 9 out of 10 cases the man is bitten by a non-poisonous snake. The snake charmer does his job. Chants some mantras, throws in some holy water, rubs some MAGIC ointment and the patient is free to go. The confidence that is given by the snake charmer is enough. The patient believes that he is cured. Remember WE ARE WHAT WE BELIEVE. The man is cured. If it is a poisonous snake the patient will die. But that the chances are dying are only 1 in 10. 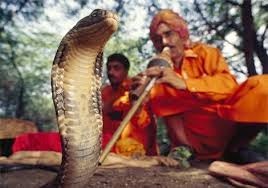 The snake charmer can still claim that the patient did not follow his instructions and that he died as a result of his carelessness. MORAL OF THE STORY: WE ARE WHAT WE BELIEVE; EVERY ONE HAS A ROLE TO PLAY INCLUDING THE RUSTIC SNAKE CHARMER, WHO INFUSES CONFIDENCE!